Tibbetts is a segmented wood turner. He cuts hundreds or thousands of small, perfectly angled wedges of wood—mainly dense hardwoods like mesquite, purpleheart, holly and curly maple, though he’s careful to never use endangered species— and glues them into rings, which are stacked, then turned and shaped on a lathe, becoming bowls, vessels and sculptures. The colors are all natural—no stains or dyes—and Tibbetts finishes pieces with several coats of sanding sealer to fill in the wood pores and at least four coats of a tung oil/urethane mixture. After a stint in the military, Tibbetts moved west, securing a job as a ski patroller at Heavenly Mountain Resort, where he eventually became vice president of operations. On the side, he developed his woodworking skills, first by crafting furniture for his South Shore home, then by creating sculptures. Though he doesn’t like the term “self taught” (“There’s no such thing,” he asserts. 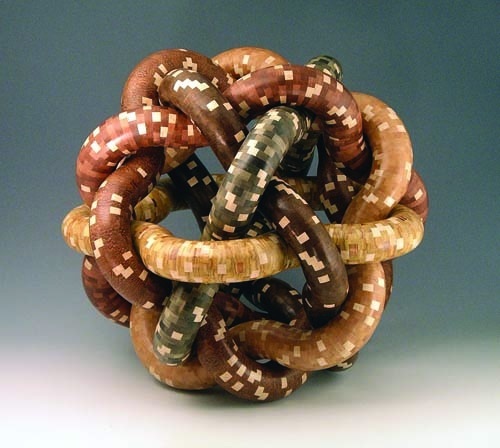 “There are too many resources to be absorbed.”), Tibbetts developed his own techniques as he delved into turning, specifically segmented wood turning, which he says is more complex but allows for more species of wood and designs. Tibbetts begins with a concept. Martin’s Dream, for example, commemorated the 45th anniversary of Martin Luther King’s “I Have a Dream” speech. A recent piece, a large looping form that features a red bus and a blue bus, was inspired in part by listening to nursery rhymes with his two-year-old grandson. “This applies to our political situation right now,” he says. “Everyone’s going in circles and not going anywhere.” The piece is titled The Wheels on the Bus. Other works have conveyed environmental, anti-war and even hunger awareness messages. These wood masterpieces are remarkably complex. One sculpture, Galactic Journey, is a series of six interlocked curving rings, each of which comprises 180 smaller rings (180 signifying a complete turnaround). Each smaller ring is made of 12 segments, representing the 12 ages of the Zodiac. There are 2,160 wood pieces in each large ring (representing the 2,160 years in a Zodiac “age”) and a grand total of 12,960 wood wedges, the number of years it takes for the Earth’s axis to align perfectly with the center of the Milky Way. Tibbetts has also produced six DVDs and taught workshops around the world. A member of the American Association of Wood Turners, Tibbetts formed a chapter that specializes in segmented wood turning and plans to hold a symposium on the South Shore in November 2012.